Ford CEO Alan Mulally personally phoned a Michigan man to thank him for canceling an order for a Toyota Prius and buying a 2010 Ford Fusion Hybrid. Seriously? Yes. There's even video to prove it. Grand Rapids, Michigan attorney Michael Snapper received an unusual call from Ford CEO Alan Mulally, who phoned to thank him for choosing the 2010 Ford Fusion Hybrid over the Prius. Since when did gratitude become "Job One?" Snapper had previously placed an order on a new Prius but once news and reviews of the 2010 Ford Fusion Hybrid started coming out he had second thoughts. After researching the car and taking its Made in Hermosillo, Mexico America status into consideration, he changed his order and tossed their lot in with the new Fusion Hybrid. News of the story somehow reached the ears of Alan Mulally, who left a message on Snapper's phone thanking him for his choice. Sure, with anemic sales, Mulally can spend the time to make phone calls to every Ford buyer, but if this reflects the kind of attitude at Ford in the future, the consumer market is going to be taking notice. 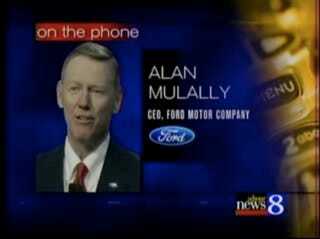 Of course if that ends up happening, Mulally may not have time to call every buyer to thank them.